Another alarm-free morning. I actually managed to wake up with loads of time to spare before check out. Can you believe it? Granny and Maude weren't too far behind in waking up this time. It was a dreary day. The sky was full of clouds and the occasional drizzle would sprinkle down randomly. At least the rain held off until our driving day. As the girls got started packing, I sat in bed for a bit, snacking on leftovers, shaking the cobwebs out, and checking out my souvenir from the night before. Shortly later, I was up in my chair and everyone was packed and ready to head home. Mom called down for a luggage cart and I took a last look at the view, as I always do. We waited. And waited. And called again. And waited some more. It was about 45 minutes until the luggage cart arrived. At least it was cool that our buddy Stu ended up being the one to bring the cart and help us head out. Before loading up the van, there was one last stop to make. We had to stop at the front desk to have them fix the bill, as they never adjusted it after we were downgraded. I hate to be negative, but I really wasn't impressed by the Hilton. 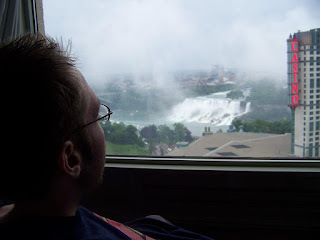 Maybe I've just been spoiled by how smoothly past trips have gone, but staying at this hotel just seemed to stress me out. I can't really see myself staying there again. 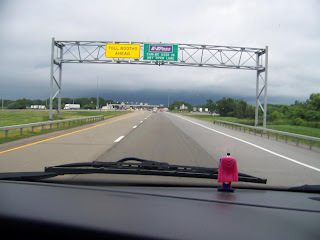 By the time we got everything squared away with the bill and packed up the van, we hit the road around 2:00 PM. The drive home was pretty routine. 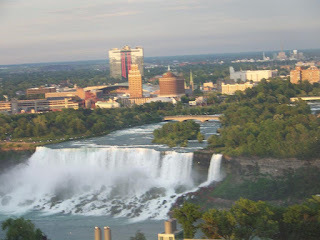 We stopped at Duty Free, I grabbed myself a few bottles of Jackson-Triggs (I loves me some Gewürztraminer), and crossed the border back into the States. The rain had stopped by the time we stopped to eat in Angola. After Angola came the long stretch of the drive. Granny and Maude dozed off in the back of the van, so for most of the ride, it was just me, Mom, and my iPod. We reached Ohio and Maude was the first to be dropped off. Then Granny. Mom and I finally arrived home at 8:00 PM, officially bringing the trip to a close. Even though I was stressed out a lot on this trip, it was still a good one and I did have fun. 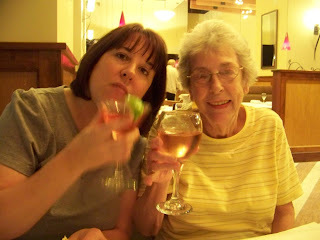 We took Granny to her second concert, she had her first long island iced tea, we saw the sights, and had lots of laughing fits. Good company, good food, good music, good drinks. It was a much needed and greatly enjoyed getaway. June 27th, 2009- "I Can Take a Wrong Turn, You're Right Behind Me"
I woke up on that nice Canadian Saturday morning without the aid of the fire alarm, thankfully. I did end up sleeping a little later than I wanted, though. Seems to happen a lot, doesn't it? Once the rest of the crew was up, we set out to get a little something to eat. 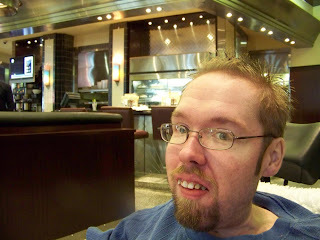 We ended up going across the street to The Famous, a diner-type restaurant inside the casino building. 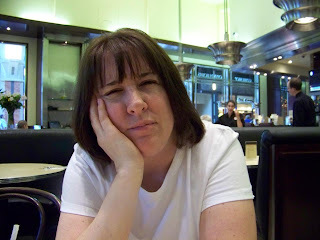 It was okay, nothing outstanding and we had to wait a long for the food and the check. I was hoping to get to the winery early enough to catch the sound check, so we hurried back to the hotel as soon as we finished eating to compensate for another potentially long wait for valet to bring the van. I swear, they must have known how ticked we were the day before and sent out a memo or something. We had the van within five minutes. Things were running smoothly and we were on our way. 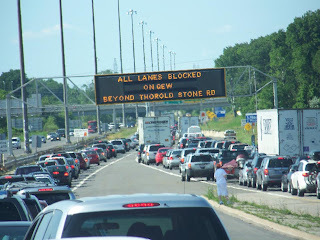 Until we got on the QEW, that is. Traffic on the freeway was at a dead stop on a hot and sunny day. We were pretty much baking inside the van. As we inched forward ever so slowly, we saw that the freeway was closed in both directions ahead of us. We later found out there had been an accident earlier and that they usually only close down both directions if they have to land a medical helicopter on the freeway. When we reached the detour, my MapQuest directions became useless, so we asked the officer directing traffic how to get to Niagara-on-the-Lake. He pointed out a van that was headed that way and told us to follow him. So we did. 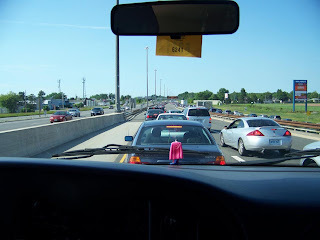 Before too long, we were back on the QEW and lined up with my directions once again. And then we got lost on the country roads and had to stop and ask for directions. When we finally arrived at the Jackson-Triggs winery, the usually 20 minute long drive from Niagara Falls to Niagara-on-the-Lake had taken 2 hours. Sadly, we missed sound check, but ended up bumping into Sandy and Kathy right as we were getting out of the van. 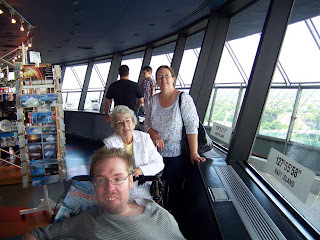 I chatted with them a little bit, then Mom, Granny, Maude, and I headed inside the main building to pick up our tickets. While inside, my friend Nadia spotted me and we talked for a few minutes. I've kept in touch with her since the last time I visited the winery, but it was great to catch up in person. Tickets in hand, we made our way toward the amphitheater and ran into Terence and Russell on our way. After chatting a little, we headed in. Our tickets included dinner, so we popped over to the food tent. We found a nice shady spot and ate while having a nice visit with Kathy and Sandy. I was a bit tense from the ride, so I didn't eat all that much, but what I had (pork, potatoes, fruit) was good. The wine certainly helped ease the tension. I went with the Chardonnay. With showtime approaching, we headed to our seats. Nadia got off of work and came over to see us again before taking off. 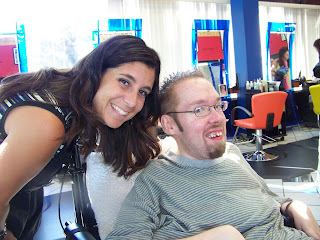 She told us about her upcoming wedding and all the fun and craziness that goes along with it. I'm sure it'll all go smoothly and I wish her all the best! Before the show started, Mom and I went to shut off our cel phones and noticed we had both missed calls from Kris. Mom called him back to make sure everything was okay and found out Matthew ate gravel. He was standing right next to Kris in their driveway and in one quick swoop, bent down, grabbed a stone, and downed it. He's fine though. He pretty much looked at Kris as if to say "Dude, chill. What's the problem?" when he was searching his mouth for the rock. Never a dull moment at home, even when we're not there. Finally, they brought Chantal down the hill on a little golf cart and she took the stage along with Kevin Fox and Karen Graves. 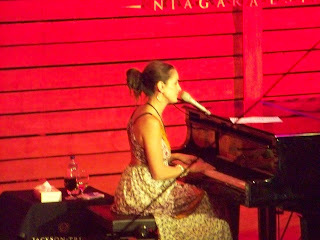 She began with another great performance of Leaving on a Jet Plane and the show was rolling. She looked radiant and, as always, sounded amazing. 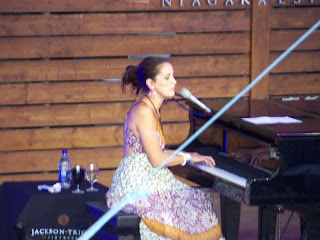 Last time she played at Jackson-Triggs, we were the first audience to hear Halfway Around the World, she continued the tradition and debuted two new songs from her upcoming album for us- Invincible and 5,000 Days. Both sounded excellent, I was especially fond of 5,000 Days. And as a bonus, it was also her first time playing These Days, a song she wrote for the Sisterhood of the Traveling Pants soundtrack, live. 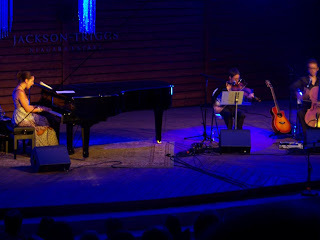 The winery is such a great setting for a concert. 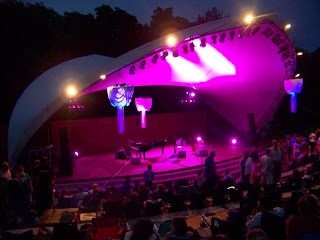 The cool, Canadian night air mixed with Chantal's music, the intimate seating arrangement, and the great wine on top of all that. Combined, it just creates a magical vibe. Chantal was her usual chatty self in between songs. The running discussion of the night was whether the occasional scent of manure wafting in from the surrounding fields came from a cow or a cat. After a few more songs, there was a short intermission. I'll admit, I took the opportunity to get a refill on my wine. 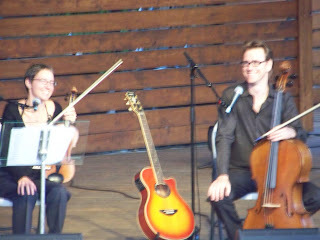 Once the sun had finished setting, Chantal, Karen, and Kevin returned and continued the show under the stars. So Cold, Half of Me, and Feels Like Home were some of the songs we got to hear in the second half. Plus, the guy who was calling out to hear Wayne all night got his wish. After "finishing", Chantal came back for an encore and played All I Can Do to end the night. It was another amazing show that I wish didn't have to end. Even with the overall hectic vibe the trip seemed to have, while I was at that concert, there was no stress and no worries. I love Twilight in the Vineyard. In a bit of awesome news, they announced that the show was recorded and will be aired on the radio in the fall to coincide with the release of Chantal's new album. I can't wait to hear it and relive that night. As the crowd made their way away from the amphitheater, we followed and headed to the main building, where Chantal would be doing an autograph signing. Inside, we caught up with Kathy and Sandy again. 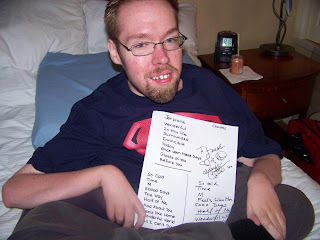 In their continuing awesomeness, they surprised me again with Chantal's setlist. I swear, I can't thank them enough. The whole group of us hung around and talked about the show while Chantal signed autographs a few feet away. Once the line started to dwindle, we headed over. 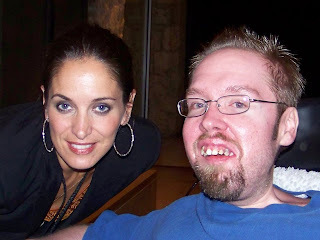 When it was my turn, I got to have a nice little visit with Chantal. I found out her album, Plain Jane is coming out in September, so that'll be a nice little birthday-month bonus for me. 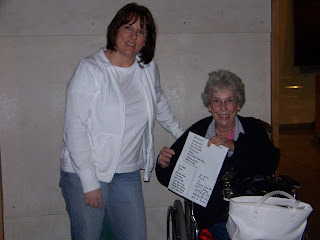 Before saying our see-you-next-times, she signed the setlist for me and of course, we took a picture together. 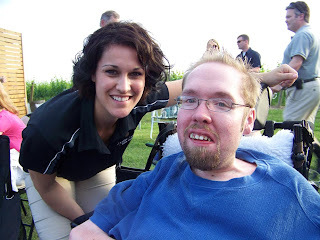 Then, I spent some time talking to Del from Jackson-Triggs. He found my blog entry about Chantal's last show at the winery and was looking forward to (and waiting patiently for) this new entry. I know it's long and kind of rambly, but I hope it was worth the wait. 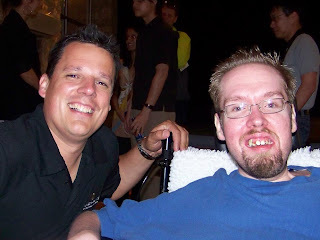 He's working at setting up some more great concerts there, so I'm sure I'll be seeing him again before too long. 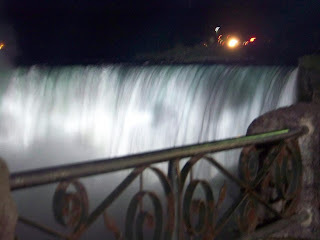 It was approaching midnight and getting chilly, so we said bye to gang, piled into the van, and headed back to Niagara Falls. The return trip was much smoother than the ride out. We only missed one turn. 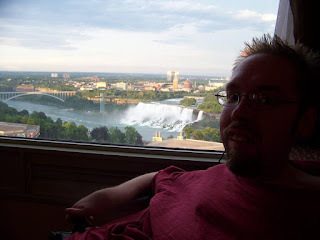 Upon getting back to the hotel, I was ready to parttake in our last-night-at-the-Falls tradition of going to Fridays. Granny didn't feel like going out and asked if we minded if she stayed behind and relaxed in the room. Of course it was no problem, though we missed having her there. So Maude, Mom, and I made the late night trek to Fridays by ourselves. 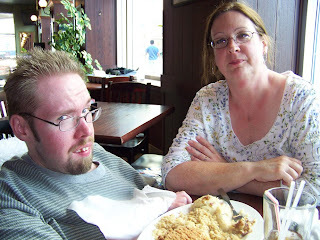 I split a meal with Mom and also got the fried macaroni and, of course, an ultimate long island iced tea. I guess I had a bit of a party night that night. It was a blast. We wandered back to hotel somewhere between 3 and 4 AM and found, to our surprise, Granny still awake and watching TV. Apparently, she watched Braveheart and Independence Day while we were out. Exhausted after a fantastic night, we all crawled off to bed for the pre-drive-home sleep. And man, I was really conked out. Vacation- a time to relax and sleep in as late as your heart desires. And then you're woken by the fire alarm going off. It was 10 AM. Mom and Maude shot out of bed, confused, looking around, trying to focus and figure out what was going on. I laid still, eyes still closed, listening. Meanwhile, Granny was in the bathroom panicking, thinking she had done something to set an alarm off. Eventually, they came on over the PA system and gave the all clear. How's that for a start to the day? I dozed for a few more minutes before getting up and snacking on some leftovers with Mom while waiting for Maude & Granny to wake up for the day. Around noon, we decided to take the initiative and help them wake up. Finally, once everyone was up and ready, we headed out. On the way to the elevator, we bumped into a lady from the housekeeping staff. While talking with her, we learned that the fire alarm goes off almost every day because of the continuing construction on the new wing. The weather was perfect. 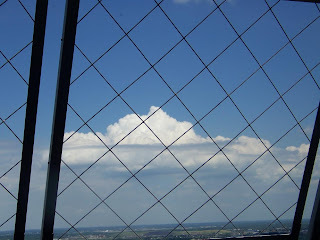 Not too hot, not too cool, and sunny skies full of puffy clouds. 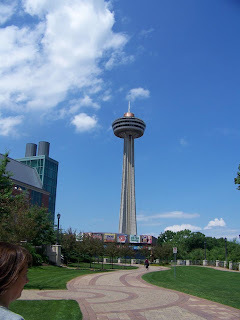 For our first stop of the day, we scooted across the street and up to the top of the Skylon Tower. It was exactly as we left it last time, but still an impressive and gorgeous view, perfect for picture taking. 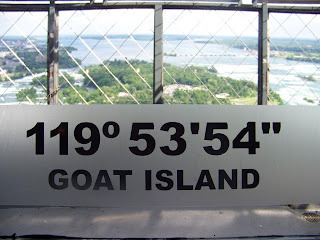 Beware Goat Island! Canada's only island fully inhabited by bloodthirsty Goat People. 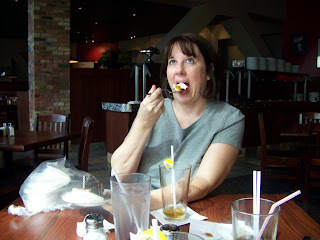 We descended down to street level and pounded the pavement up to Tony Romas for a (really) late breakfast. I had been craving some really good chicken fingers for a while and these totally hit the spot. 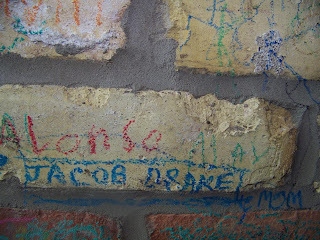 We also went and found my brick from last time. I love it there- the food, the music they play, it all just does it for me. I wish we still had a Tony Romas around here. Next up, we were aiming for the Pen Centre, so we headed back to hotel to get the van. The sign said to allow up to fifteen minutes for valet to bring your vehicle. No biggie. So we waited. A half hour went by before the van showed up. I've always been one to keep my cool when I'm frustrated, but this was pushing it. The little things were piling up and I wasn't digging this hotel. So, we loaded into the van and hurried off toward St Catharines. We wandered around the Pen Centre for a couple hours. It's so much bigger and nicer than the malls around here, I actually love just roaming around inside. It's even interesting to people-watch, it's so noticeable how much more peaceful, laid back, and just generally happy Canadians are compared to most folks in these parts. 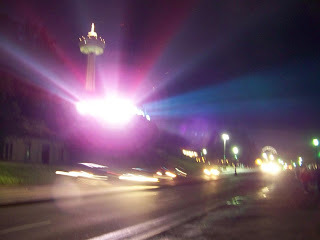 I bought myself a copy of Let the Right One In on DVD and we headed back towards Niagara Falls. 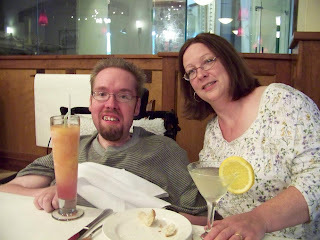 We dropped off our purchases in our room, then made our way back down to the first floor to get some dinner at Romano's Macaroni Grill. I'm a macaroni junkie, so I was ready to chow down. So, we got to our table, looked at our menus for a few minutes, and then I asked a question I didn't think I'd have to ask- "Does anyone see macaroni on the menu?" We asked our waiter and it was confirmed. 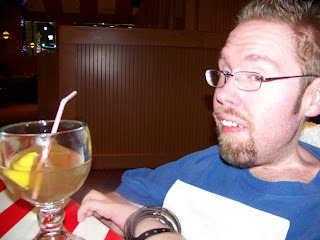 Romano's Macaroni Grill does not serve macaroni. Macaroni disappointment aside, dinner was good. 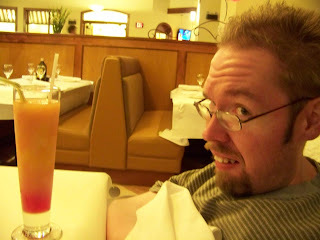 I particularly enjoyed the ultimate leaning bellini I had. The restaurant itself basically seemed like a slightly more upscale (pricier) version of Olive Garden, though I think I prefer Olive Garden. From there, we headed across the street to the casino for a little while. I'm not much of a gambler, so as usual, I gave myself a nice low limit and stuck to the slots. In the end, I didn't win anything, but had a good time playing. 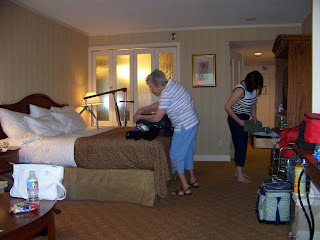 It was getting late, so once Granny and Maude finished on the slots, we mozied on back to the room. 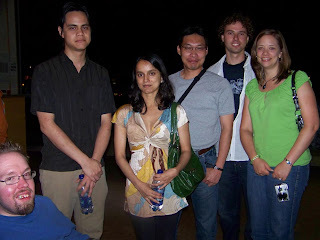 The next day was the concert, so I definitely wanted to be well rested. Stuffed, tired, and hoping for no more fire alarms, I drifted off to sleep. As usual, I had planned to leave early in the day, around 9 or 10 AM. Also as usual, we got off to a late start, leaving the house around noon. Our first stop was a couple streets over to pick up Granny. We grabbed Granny, then Maude called just as we set out to pick her up. She called, saying that the news was reporting Farrah Fawcett died. It's weird, celebrities seem to die when I go on vacation. Anna Nicole Smith, Steve Irwin, etc. Kinda creepy. So, by the time we drove out, picked up Maude, and really on the road, it was somewhere around 2 PM. Definitely later than I had hoped. The ride started out pretty smooth, despite the hot (especially hot for this summer) temperatures. As we drove through Pennsylvania, approaching the New York border, the skies in front of us grew dark. A few minutes later, we were driving through a downpour, accented by heavy winds and some wicked looking lightning. Thankfully, most of it had stopped by the time we reached the rest stop in Angola, save for the occasional stray drizzle. We popped in, grabbed a quick bite at Denny's, and got back on the road. 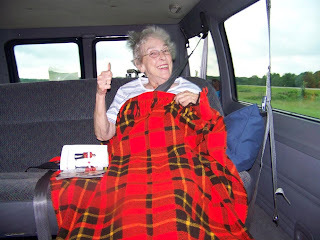 A windblown Granny tells us it's all good! 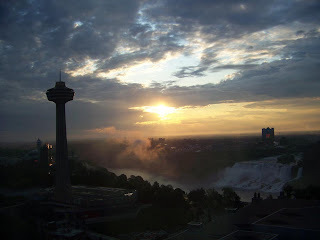 We finally crossed the Peace Bridge into Canada, rode into Niagara Falls, and arrived at Hilton around 7 PM. As we pulled in and waited to unload the van, Baytosh called to tell us that Michael Jackson had died. That one was a bit of a shocker. We unloaded and headed in. I was pumped. The Hilton had been renovating for a while and the room I booked was part of the brand new wing, which opened less than a month earlier. Only three of the six elevators were up and running at the time, so there was a bit of a wait, but I figured it's just one little inconvenience. The bellman that helped us to our room, Stu, was really cool. 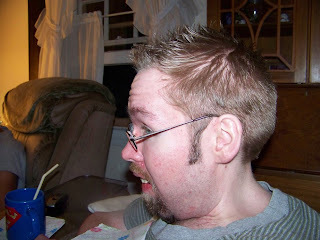 He kind of looked like Simon Pegg. All was going well, the room looked great. 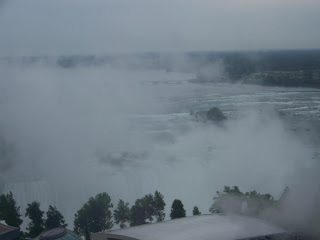 Excellent view of the Falls, fireplace, flat-screen TV's...then we found a sizeable problem. To summarize, the bathroom door wasn't exactly handicap-friendly and I'm fairly sure I wouldn't have been able to hold it all weekend. Stu went from room to room, checking to see if any of the bathroom doors were different, but no luck. 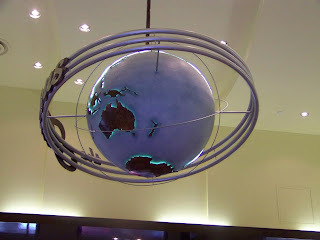 He hung around with us for quite a while, calling down to the front desk, searching for any kind of solution for us. Finally we ended up downgrading and moving over to a room in the older wing. 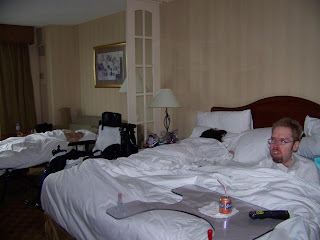 We got into that room around 8 PM. As they unpacked, and helped the confused lady who thought our room was hers, I flicked on the TV and saw that The Dark Knight was on and it was right at the pencil scene. That was an enjoyable little moment of relaxation. 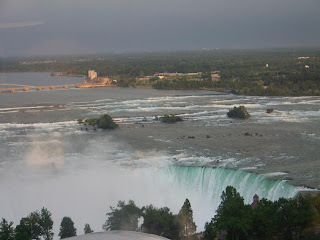 It was starting to get dark out and I wanted to do something, so we left the room and aimed for the Falls. 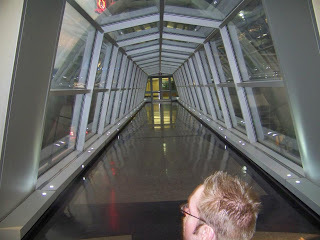 We decided to cut through casino, so we took the walkway that went over the street that connected our hotel to the casino. So, we walk cross over the street...and find stairs on the other side. 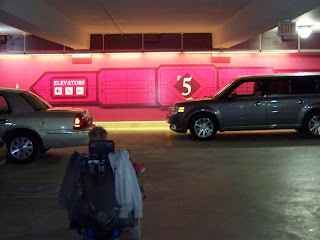 Besides turning around and going back, the only way into the casino was through the parking garage, so through the parking garage we went. 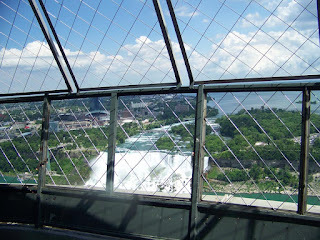 Through the casino, down the hill, and we were down by the Falls. 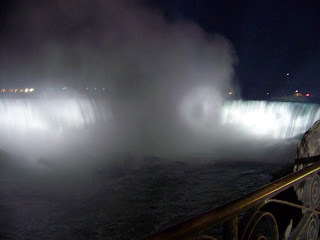 We made our way up the sidewalk and through the mist and looked at the Falls, illuminated in the night. 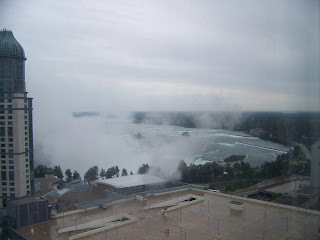 Once at the top of the Falls, it was getting a bit chilly, so we shuffled into the Table Rock building to warm up a little. 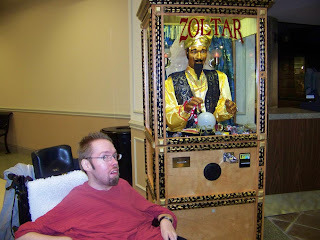 While inside, I consulted the all-knowing mystic, Zoltar! And before you ask, no, I didn't wish I was big. 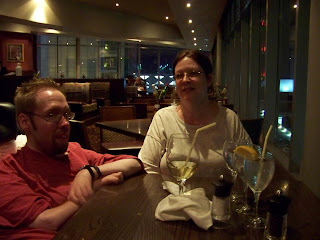 It was getting late, so we headed back up the hill and had dinner at the Keg inside the Embassy Suites. As always, it was delicious. Totally stuffed, we made our way back up the street to our hotel to get some shut-eye and prepare for a full day. I've been back from my trip for a week and haven't gotten caught up enough to blog about it yet. I'll do that soon, but for now, here's a short entry. 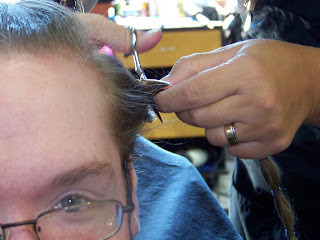 Back on the 23rd, I went and donated my hair again. 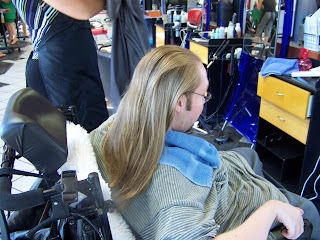 It was getting really long and I was ready, so Erin at Imagine Salon & Spa went to work on my mane. 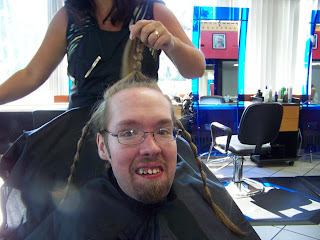 As usual, it felt really good to donate it, plus I had a brand new do when I hit the road. So, does it look alright?